Off-weight bearing plaster cast moulds are taken of your feet, together with measurements taken during the hands-on assessment. We would then write a specific prescription and send this together with the casts to the laboratory. Your orthotics would then be designed and manufactured using the latest CAD-CAM technology available. Your orthotics are custom made specifically for you to promote more effective function of your feet and so, in turn, improve your quality of life. 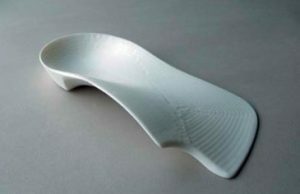 Your orthotics are matched to your precise needs, for greater comfort and greater control, due to the fact that we can tailor the shell flexibility to your weight. But most importantly the control within the device is bespoke to your individual requirements. Your state-of-the-art lightweight orthotics are extremely versatile and easily transferable between different pairs of shoes, including your existing footwear. Your orthotics are manufactured from high quality polypropylene and are guaranteed against breakage in normal use.